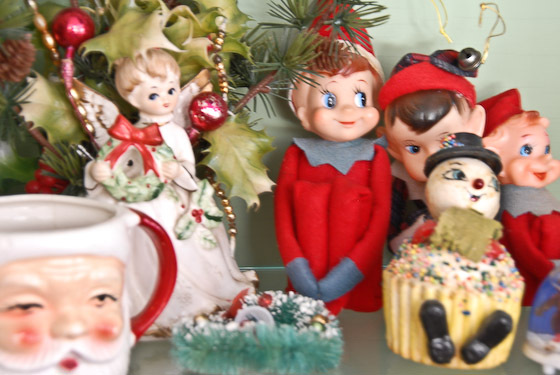 I love kitsch Christmas decorations and wanted to quickly share a few of my goodies before more elf duty. German Santa candy containers with the glitter hats. They are kind of rare and I made a gasping sound when I found them. You kind of can’t see him too well, but the tan Santa is from the family and some of my earliest Christmas memories are of putting him, and his twin, out. The German nodder was given to me as a gift last year. And boy do I love elves! Lots and lots of kneehugger elves around here. 🙂 They ride reindeer and pop up all over the place. I tried giving him to her as she obviously liked him but she wouldn’t take him no matter how I tried. A short while later and she was gone. I miss her every day and when I put the cupcake snowman out at Christmas I think of sitting in a warm, sunny kitchen with her. That visit went like so many others. We would put the old Farberware kettle with the swoopy handle onto boil and I can hear in my mind the clack of the teacups as I washed them up in the old white farm sink afterwards. Then there was the laughter, always lots of it. She taught me to stop and revel in the little things. To me, that’s so much part of the spirit of Christmas. Being grateful for what you have – and have had – in your life. 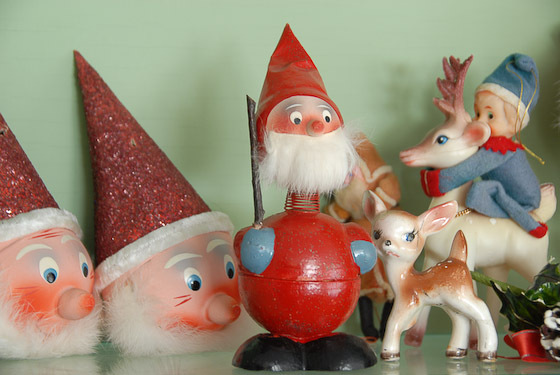 My kitsch Christmas just reminds me. I don't like spam, either, and will not use your email address for anything other than these blog subscription alerts.